Pesticides play an important role in agricultural development. Aim to solve the problems of pesticide industry, pesticide policies focus on all aspects of pesticides such as registration, production, business, environmental protection, pesticide residue and so on. Environmental pollution: Production and use of pesticides can lead to serious environmental pollution. Base on environmental protection and control in 2016, the Ministry of Environmental Protection of the People's Republic of China (the MEP) has intensified efforts to protect the environment in 2017. After the MEP announced the key works, work programs were introduced by local governments in succession. This will have significant influence on pesticide industry. Pesticide enterprises are facing more and more environmental pressure in 2017. Overuse of pesticides: Overuse of pesticides can bring about some problems, such as excessive pesticide residues in agricultural produce, crop injury and environmental pollution, which have always been the concern for people from all walks of life. Therefore, in recent years, the Ministry of Agriculture of the People's Republic of China (the MOA) has formulated detailed policies on pesticide residue standard, prohibition of high toxicity pesticides and zero growth of pesticide usage, which will remain effective in 2017. What's more, some new policies on excessive pesticide residues were formulated in 2017. It's likely that the issue of overuse will be well solved in the future. Counterfeit and inferior pesticides: Counterfeit and inferior pesticides have plagued the entire pesticide industry and restricted the development of pesticide industry. The new Regulations on Pesticide Administration focuses more on market order monitoring with stricter punishment on illegal behaviors, which will help to improve the problem of counterfeit and inferior pesticides and contribute to the healthy development of domestic pesticide market. In the meantime, policies on the production and circulation of pesticides have also been strengthened with stronger regulation. Except for the above, other issues and policies of pesticide industry that are worth paying attention to in 2017 are given in this report. 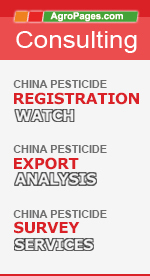 Aspects: Pesticide registration administration policies, pesticide business policies, pesticide production policies, environment protection policies related to pesticides, pesticide residue policies, restricted pesticide policies and other pesticide policies. 1.4 Scheme of Accelerating the “Internet + agricultural government affairs service"